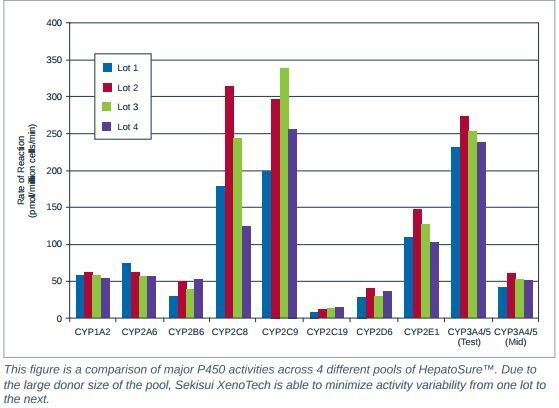 HepatoSure® is a pool of human hepatocytes designed to facilitate your DMPK applications with a consistent hepatocyte product over time (years). HepatoSure® is best suited for both discovery and development of ADME-Tox study assays where generation and comparison of data is required. Let’s take a closer look, and you might like to benefit from our current offer to try these for yourself (see below). Including 100 individual donors (from mixed gender) with little variation from lot-to-lot and large lot sizes, HepatoSure® enables you to minimize assay setup and validation repeat associated with changing donors and lots. Applications recommended for HepatoSure® include evaluation of hepatic metabolism (both CYP and non-CYP enzymes), transporter-mediated uptake, enzyme or transporter inhibition and metabolite profiling and identification. What are the main benefits of HepatoSure®? 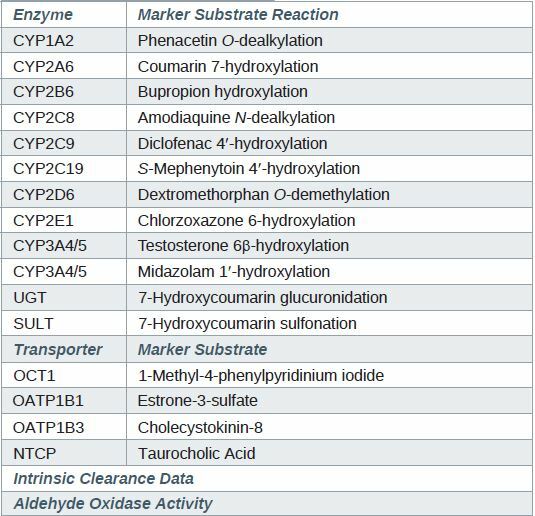 Each lot of HepatoSure® is characterized for activity of several CYPS and other DME enzymes, including multiple cytochrome P450s, UDP-Glucuronosyltransferases (UGT), Sulfotransferases (SULT) and aldehyde oxidase (AO). Several additional drug metabolizing enzyme activities can be characterized upon request. The complement of these hepatic enzyme systems enables evaluation of several types of metabolism endpoints. HepatoSure® can be used for short- and long-term metabolic clearance studies in suspension and enzyme phenotyping in the presence or absence of specific chemical inhibitors of CYP and/or non-CYP enzymes. by various combinations of CYP, UGT and AO activities. Additionally, HepatoSure® can be used for metabolite profiling and identification studies. Pooled human hepatocytes can complement a selection of hepatocytes from various species for metabolite profiling, species comparison and evaluation of potential human-specific metabolites. Transporters: Each lot of HepatoSure® is characterized for several hepatic uptake transporters, including OATP1B1 (estrone-3-sulfate), OATP1B3 (CCK-8), OCT1 (MPP+) and NTCP (taurocholate). HepatoSure® serves as an excellent tool to evaluate whether a drug candidate is a substrate for active hepatic uptake with the oil-spin or medium loss methods and, furthermore, to determine active and passive uptake clearances with the aforementioned experimental approaches. Transporter phenotyping can be conducted with methods that employ chemical inhibitors (transporter specific). Additionally, lysosomal trapping or sequestration can be evaluated with HepatoSure®. Enzyme or Transporter Inhibition: With a full complement of drug metabolizing enzymes and transporters, HepatoSure® is an excellent tool for evaluation of enzyme or transporter inhibition. The large number of donors and large lot sizes minimizes the contribution of a single individual or sub-population (e.g. CYP2D6 PM’s) and enables rapid assay development and validation when new lots are needed. XenoTech’s HepatoSure® pooled human cryopreserved hepatocytes are shipped with a HepatoSure® OptiThaw Kit. This kit contains a nutrient rich media to ensure consistent yield and high viability post-thaw. Each kit is sufficient to thaw and isolate up to three 1.5mL vials of HepatoSure®. When using the OptiThaw kit in conjunction with XenoTech’s HepatoSure® pooled cryopreserved human hepatocyte product, you are guaranteed a post-thaw viability of 70% or higher. HepatoSure® was tested against a comparable product currently on the market and demonstrated similar viability, enzymatic activity and overall performance. Costing less than the competition, HepatoSure® includes 100 donors, provides the necessary media for thawing and isolation (HepatoSure® Optimization Kit) and delivers high quality, consistent hepatocytes.HepatoSure® is a pooled human hepatocyte product designed to facilitate DMPK applications with a more consistent hepatocyte product year after year. We currently have a short term offer with a one-off 20% discount on 2 lots of HepatoSure®, for as long as stocks last. You can download the datasheets for these 2 lots here. You can also contact me if you wish to receive any additional information on our Hepatosure, or regarding products we can provide for your ADME-Tox studies in a more general way (single freeze smaller pools or individual donor hepatocytes, subcellular fractions with high custom possibilities, transporter studies cells, and much more.